A 13-year-old girl from Wisconsin who went missing in October after her parents were murdered has been found alive, officials say. Jayme Closs, whose parents were shot dead in their family home last year, was located on Thursday evening, police said. They said a suspect believed to be linked to the case was now in custody. Jayme reportedly escaped from a rural home near Gordon, Wisconsin, and was found bedraggled by residents. "We promised to bring Jayme home and tonight we get to fulfil that promise," a police statement said. No other details were given but police are due to hold a press briefing later on Friday. Nothing official has been said but some details have emerged on local media. KARE-TV said Jayme was found in a small development with few residents about six miles (10km) east of Gordon. The Minneapolis Star Tribune quoted a teacher at a local school as saying a neighbour walking her dog had knocked on her door after having found Jayme. The teacher said Jayme was skinny, dirty and wearing shoes too large for her feet. 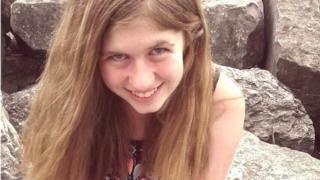 "This is Jayme Closs! Call 911!" the neighbour told the teacher, according to the Star Tribune. Jayme stayed at the teacher's home for about 20 minutes and declined food and water, Associated Press reports. The Star Tribune quoted a local sheriff as saying the suspect was arrested minutes later and that Jayme was taken to hospital. What have police said about the murders? On 15 October last year, emergency services received a call from the family's home in Barron. They heard a disturbance in the background but no-one spoke to them directly. When police arrived four minutes later, James and Denise Closs were found dead at the scene. No gun or suspects were found and there was no sign of Jayme. The following Wednesday, their deaths were ruled as homicide by a medical examiner. At a news conference, police said they had received about 400 tips from the public since the 13-year-old disappeared three months ago. A missing persons alert stated that she was taken from her home by "unknown individual(s), likely with a gun". The day before her parents were murdered Jayme attended a family birthday party with her mother while her father was at work, her grandfather has said. Robert Naiberg told the Associated Press that nothing seemed amiss at the gathering, and that Jayme was "quiet as always".